Everyone loves those bright, beautiful LED headlights that come on luxury cars. Sadly, not everyone can afford to (or wants to) spend money on a luxury car. If you want the improved visibility, enhanced safety, and awesome look that LED headlights provide, you don’t need to dump $50,000+ on a car. In fact, you can get the same great headlights on any car you already have. 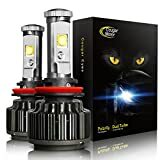 The CougarMotor LED Headlight Bulbs All-in-One Conversion Kit comes in nine different sizes to fit any car on the road. It converts your old halogen headlights into LEDs that are 200% brighter, and it only takes about 20 minutes to install — even if you don’t have any experience working on cars!